lovelifetea | A mother and daughter who love to cook, bake and laugh. Join us for daily life stories, recipes, and a cup of tea. A mother and daughter who love to cook, bake and laugh. Join us for daily life stories, recipes, and a cup of tea. We’ve been dormant for a while over here. In the months that have passed, I have been frustrated with my health, then resigned to my body’s food reactions, and then proactive once again in trying to solve my ongoing issues. Enter my new naturopath. I randomly chose a new clinic out of the phone book, based only on their proximity to my home. I met a lovely naturopath who took one look at my symptoms and asked, “Have you ever heard of SIBO?” The answer was no, I had not. Apparently my answers to her questions and the complaints I presented with totaled nine out of the top ten SIBO symptoms. So – what is SIBO? Small intestine bacterial overgrowth. Specifically, bacteria that should be in the large intestine has somehow migrated up into the small intestine, and is feeding on things it shouldn’t be feeding on. One of the hallmarks of the disease is that you lose more and more foods from your diet – in my case (in order of food elimination) – dairy, gluten, soy, nuts, eggs, strawberries, avocado. Every time you eliminate a food the bacteria have been feeding on, they move to another one. Thus the vast assortment of eliminated foods. For me, the question of whether I had SIBO resulted in doing a test, which confirmed I had both types. I have likely had this for the duration of my stomach problems – 25 years, give or take a year or two. Step one in treatment was – keep eating the way I was, but while doing so take a rotating variety of herbal antibiotics for six weeks. Step one was fine. Step two however……I am not a fan. Ha. Step two involves a fairly limited diet, and for me, the hardest step by far was the elimination of all sugar. ALL SUGAR. Did you know bacon has sugar in it? And lunch meat? And sauces, and ketchup, and salad dressings, and everything in the world??? Seemingly so, anyway. Also, most starch is gone from my diet. This diet can last three months to a year. I am four months in, and while I have seen significant improvement, I can just tell my body is not ready for the cessation of this eating plan quite yet. The goal of the diet is to starve off any of the bacteria that weren’t killed off by the antibiotics. One happy side effect (for me) has been weight loss, and because of this, coming off blood pressure medication. Another plus is that I have been able to eat eggs and nuts again – well, almond flour, anyway. The diet I am following is by Dr. Alison Siebecker, one of the leading experts on SIBO. A couple of months ago I was contacted by a representative from Enjoy Life, who wondered if I would like to take part in a product sampling, and a campaign called #SpringFreely. Of course I said yes! I waited in anticipation, and at the end of last week a box was delivered to my door. In it was a box of brownie mix, two different types of cookies, a small mason jar, mini chocolate chips, a recipe card, and a seed packet for dill. I added a couple of items of my own – the decorative flowers, the CocoWhip, and some coloured organic coconut. After waiting for a day when Kate and the kids were available (she’s WAY busier than I am), we finally got together to make our dirt cups. And although she didn’t make it into any pictures, my Mom was also there, so this was a four generation endeavor! *It is my opinion that, when assembling edible goods with a toddler and a four year old around, you should also have a dog. My dog Toby saved me a LOT of floor clean-up work. * Ha, ha. I made chocolate pudding that morning, so we would be set to go when they got here. Our first step was to stir some dry brownie mix and mini chocolate chips into the pudding, to created a textured “dirt”. Baby girl was just enjoying life in the background, and sneaking cookie pieces. Next we put our “dirt” in four small mason jars. Now for some gritty texture. We put a few of both kinds of cookies (Vanilla Honey Graham and Double Chocolate) into separate Ziploc bags, and used a cup to bash them into pieces. That was fun! We finished off the smashing of cookies with our fists. We layered light crumbs, Cocowhip, dark crumbs, more Cocowhip, and coloured coconut, to simulate grass growing. Lastly we topped them off with a flower, for springtime! A happy boy with his creation! And finally, just so nothing would go to waste, Jackson consented to clean up the leftovers. As you can see, just because Enjoy Life products are free of the top eight allergens does NOT mean they lack in flavour. Children don’t eat what they don’t like! Oh – and look at that – my Mom DID make it into a picture (see below). Not that she’ll be happy about it, but we’ll leave it, and maybe she won’t notice. Ha, ha. Thank you, Enjoy Life, for including us in this product campaign. We loved it, and we would be more than happy to help spread the joy of your products and sample in the future! At the end of last week, I got my hands on (and by “got my hands on” I mean, saw it at Costco, grabbed a copy greedily, hugged it, and did a little happy dance) the new cookbook put out by the mother/daughter team of Kelly Childs and Erin Weatherbee, owners of Kelly’s Bake Shoppe and Lettuce Love Cafe in Burlington, Ontario. I love to go to Burlington and walk the pier and waterfront area, ending up, of course, at Kelly’s Bake Shoppe for a treat to eat, and some to bring home. If you’ve never been, check out the blog post we wrote here, when we were chosen to feature and review them on our blog. I made the difficult choice of what to bake first, and I chose the Ginger-Chocolate Cookies. They turned out exactly as shown in the book’s picture, and were given an enthusiastic two thumbs up by everyone from my four year old grandson to my mom, whose age will not be published. Ha, ha. Next I recreated my chocolate potato cake, and used the Chocolate Ganache featured in the book. This is the same ganache used to fill their cupcakes and ice their fantastic brownies. It turned out perfectly as well. And finally, for supper last night I used the recipe for Sweet Potato Quinoa Burgers. The flavour of these was great, and they held together amazingly well. They were quite yummy, with a lovely blend of spices to perk up the flavour of the sweet potato. The exterior became crispy as I prepared them in a thin layer of garlic olive oil in a pan. That’s all I’ve had time to test so far, but I have no trouble in believing that each recipe will be equally good. Well done, Kelly and Erinn! Hi all! I missed posting last week – oops. Last week was incredibly busy for me, as I had the privilege of being involved in our church’s Easter production called The Rock. It was a one hour original play with music and drama, and was just so fun to be a part of! I played K2 – the second keyboard, responsible for all string sounds. In case you want to check it out, I will post the link here. It’s probably not what you think of when you think of a church play, so check it out. This week’s post will be a healthy little veggie burger. This recipe is heavily based on one by Angela Liddon – Oh She Glows – with a few changes to make it one that I can eat. They hold together really well, and I’m wondering if they might even hold together well enough to put on the bbq this summer. Mash the beans into a paste. Stir in the rest of the ingredients. Adjust seasoning to your own taste. Shape into patties with your hands. (7 or 8). Place on a parchment lined baking sheet. Bake at 350* F for 15 minutes. Flip over, and bake for 10-15 min. more. Happy St. Patrick’s Day! In honour of the day, I’ve made myself a green smoothie for breakfast. Anyway, on those days, I find a good option for me is a smoothie. I can still sneak in a lot of nutrients, and the BlendTec breaks everything down for me, so it’s easy to digest. I can take sips through the day and before you know it I’ve “eaten” some fruit and veggies. I borrowed heavily from Angela Liddon’s Tropical Green Monster Smoothie recipe for this one, switching up some things for personal taste. Check her out over at Oh She Glows. Her recipes are awesome! Throw all the ingredients into a high powered blender (I am fortunate enough to have a husband who agreed with me buying a BlendTec- when I found one on sale). Set to Whole Foods and let ‘er rip! It’s Friday!! It’s March Break (next week)!! So many good things about today! Melt the margarine and SuperButter together in a microwave. Do it in 30 second increments, stirring to combine. Stir in the graham wafer crumbs and icing sugar until well combined. Press firmly into an ungreased 8 x 8 pan. Melt together 3/4 cup Enjoy Life chocolate chips and a heaping tbsp. of margarine. Spread over squares. Refrigerate to firm up. HOWEVER – remember to cut them before the glaze is set, or it will just crack and break apart as you cut your squares. Ta-da! A simple Friday recipe to make for a yummy treat. Before I begin today, I want to start by saying that I know that there are many single dads, stay-at-home dads and just dads in general! However, when I write posts like this, I write from the perspective of the mother and do not try to constantly write “mom/dad.” I am writing from my perspective and I know that many will relate to my stories, but some won’t – moms and dads included. I have a unique perspective…at least I like to think so! I know what it’s like to be a working mom (outside the house). I know what’s it’s like to be a work-at-home mom. I can relate to stay-at-home moms, but some things are a lot different for me because I am running a business as well. I will not pretend that one (working mom, WAHM, SAHM) is more difficult because I know that being a mom is hard no matter what you “do.” It’s fun, exciting, tiring, difficult and wonderful all at the same time! I was doing my glamorous work-at-home job today, like everyday, and I had the house semi-quiet as my son was at preschool. I had a coaching call scheduled with our Sales & Field Development Manager for an hour this morning, and I thought to myself, “Piece of cake. One’s at school, the other is self-entertained. 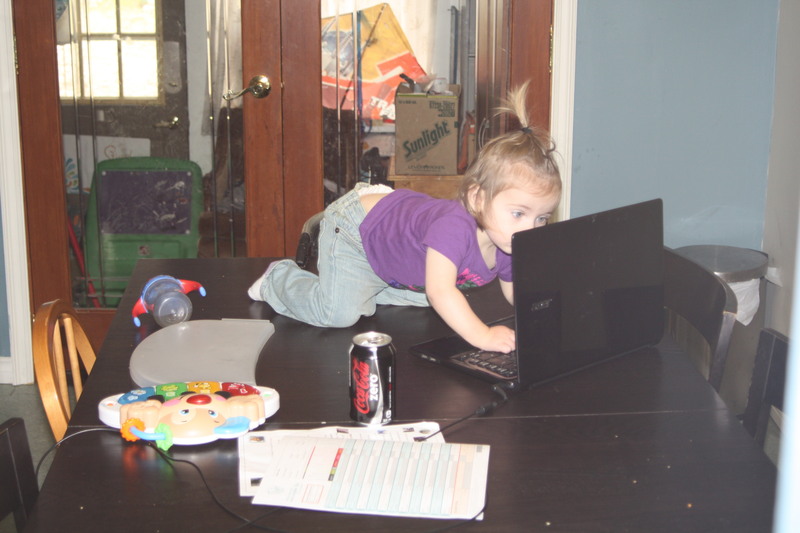 I got this.” My baby, now a year and a half, was quite jolly this morning, so I let her play for awhile and then put her in her chair and let her watch some Paw Patrol on my lap top. She was especially thrilled, as we typically only turn on shows on Saturday. I wasn’t terribly pre-occupied or trying to multi-task…a quiet moment. I don’t have an office, and I needed to keep an eye on my child, of course, so I was camped out in the living room. We have a cut-out design in the wall overlooking the kitchen, so I could walk around the room watching her and chatting as needed. After awhile, I started hearing noises that I was not expecting, so I carefully continued with the call while tuning my ear in my baby’s direction. I heard the mouse click…and click…and click…and quiet giggling. I started wandering over to the kitchen, all the while trying to not lose my concentration or become dis-engaged with the call. This is what it’s like being a work-at-home mom or a stay-at-home mom. And these are the moments that I wouldn’t trade for anything. Sandy is a Mom of three grown children, and Kate is a Mom of two.